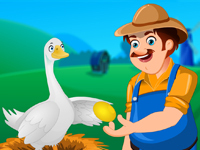 The Goose That Laid The Golden Eggs is a story of a man who had a good fortune to have a goose that laid a golden egg everyday. But soon the man became greedy and thought of harming the goose so that he can fetch all the golden eggs and become rich soon. Unfortunately, he was let empty-handed. Moral : Much wants more, and loses all.